You invest a lot of money in your fine jewelry and other valuable items. It is important to keep them clean and looking their best. An ultrasonic jewelry cleaner can help you achieve this. These devices clean your most precious treasures without the use of harsh chemicals and damaging scrubbing. The result is a sparkling piece of jewelry that will remind you of the day you bought it. Use the following information and recommendations to help you select the best ultrasonic cleaner for your own individual needs. The Magnasonic Ultrasonic Professional Polishing Jewelry Cleaner can restore all of your valuable pieces back to their original beauty. It only uses water along with 42,000 Hz of waves that work to gently remove all of the dirt and grime in a matter of minutes. Cleaning solutions can be added for all of those extra dirty pieces of jewelry that you wear daily. You can choose from five different preset cleaning cycles. This allows you to have complete control over how intense it will clean. You will find this device will give you professional results from all of your jewelry items as well as watches, eyeglasses, razor blades, dentures, and utensils. This machine is ideal for commercial, business, or home use. 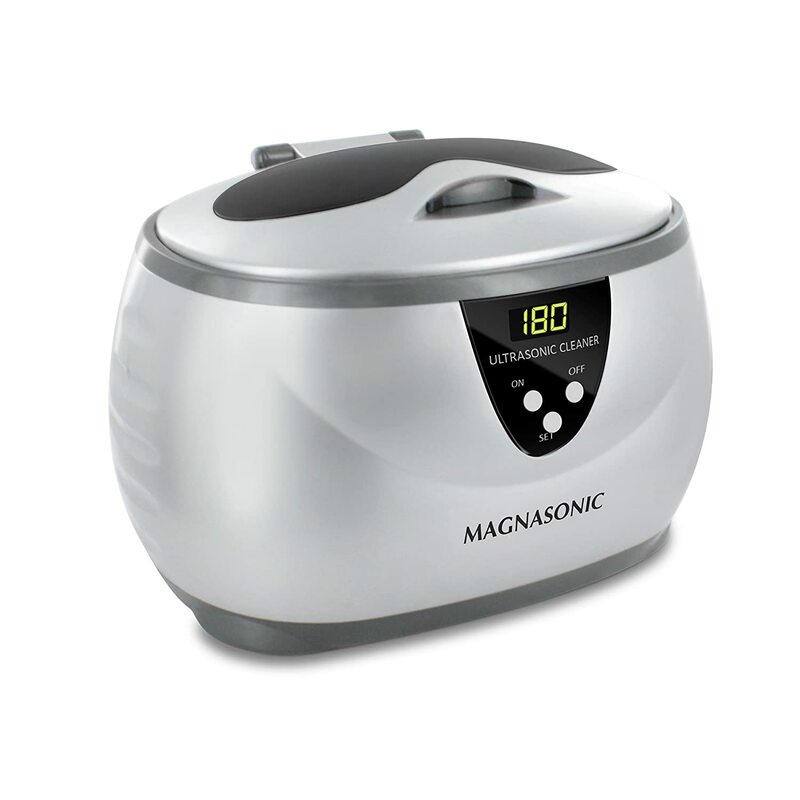 The Magnasonic Professional Ultrasonic Jewelry Cleaner is simple to operate. Fill its tank with water and add your items that need to be cleaned. Items can be placed directly into the device’s chamber or you can use the basket that comes with it. Select your cycle by pushing the appropriate button. You will soon be seeing professional results in your own home. A small amount of liquid soap may be added to enhance the experience, but the majority of the cleaning is accomplished by the ultrasonic waves. Your items are cleaned quickly without any damage to them. This cleaner includes a digital display, auto shut off, and five preset cycles to pick from. The cycles include 90, 180, 280, 380, or 480 seconds. Which one you select depends upon the cleaning time needed for each particular item. Best of all, it is easy to operate. You just pick the correct time and watch as the timer counts down. When the cycle is complete, the machine automatically turns off. The 42000Hz of ultrasonic energy can create millions of microscopic bubbles for cleaning that will gently remove dirt without the use of harsh chemicals or back breaking scrubbing. The water won’t look like its doing that much, but it is actually giving your items a thorough cleaning that will even reach the most hard to get to areas of each piece it cleans. The Magnasonic Professional Ultrasonic Polishing Jewelry Cleaner includes a stainless steel chamber that has a 20 ounce capacity. The interior of this chamber measures five inches long by 3.6 inches wide by 2.1 inches high. This gives you ample room for a variety of items you may want to clean. The device will still operate if the top is left open. This means you can clean larger things by doing first one side and then flipping them over to clean the other side. The exterior will measure 8.2 by 5.8 by 5.4 inches, and it weighs 2.2 pounds. This ultrasonic cleaner is very quiet to use. It creates a small humming noise when running. Even the longest cleaning cycle will only last eight minutes so even the humming is quite tolerable. The interior of the chamber is stainless steel while the basket they provide for delicate pieces is plastic. The device comes with a manufacturer’s one year warranty on parts and labor. Online reviews speak highly of this particular ultrasonic jewelry cleaner. Many people were amazed the first time they tried using it. They said that it looked like nothing was happening, but once the cycle was complete; the water had turned a murky color and their jewelry pieces were sparkling clean. The rack inside of the chamber allows you to clean watches easily, even if they are not waterproof. You will simply drape the watch over the rack so that only the band is immersed in the liquid. Owners of the Magnasonic Professional Ultrasonic Jewelry Cleaner love how it keeps all of their items looking brand new. The BlackHillsGoldSource Model 890 Professional Ultrasonic Cleaner uses 42,000 Hz of powerful high frequency sound waves to carefully agitate and remove dirt and grime from your most valuable items without damaging them. It will safely lift away caked on dirt. The tank has a capacity of 600ml or 20.288 ounces which can handle many of your larger pieces. It plugs into any standard 120 volt wall outlet. You will never have to worry about replacing batteries in this ultrasonic cleaner. One of the attractive features of this jewelry cleaner is the 30 minute timer. The easy to see display screen includes 18 cleaning cycles that are pre-set into the device. These cycles range from 90 seconds all the way up to 30 minutes for a deeper clean. Once the cycle is completed, the cleaner will shut off automatically. This gives you ample time to move on to other tasks while your items are being cleaned. The Black Hills Gold Source ultrasonic jewelry cleaner will remove dirt and grime from much more than just your valuable accessories. Use this for dentures, toothbrushes, Invisalign retainers, body piercings, eyeglasses, watches, baby pacifiers, tableware, and many more household tools. You will be able to keep all of these things looking brand new. It will easily remove skin particles, cosmetics, and built-up dirt from hard to reach areas such as the arms and hinges of eyeglasses. This ultrasonic cleaner will measure 8.1 by 5.2 by 6 inches, and it weighs 1.7 pounds. This makes it lightweight enough to be portable, and it is quiet to run. The entire device cleans up easily and is simple to store as well as being convenient to use. It is RoHS and CE certified along with being ecologically friendly and safe. The 30 minute timer allows you to even use this machine for steeping personal, small amounts of e-liquids like Liposomal Vitamin C.
The Black Hills Gold Source Ultrasonic Jewelry Cleaner works by using a high frequency vibration plate underneath the tank to make millions of microscopic bubbles and waves that will carefully remove the dirt and grime from your items without harsh chemicals and vigorous brushing. The tank is constructed of stainless steel so you won’t have to worry about rust or staining. Each cycle can be finished with a buffing from a soft cloth to make your jewelry pieces look new again. 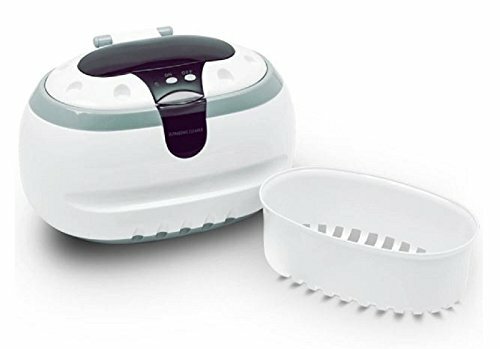 Those who post online reviews of this particular ultrasonic jewelry cleaner love that it is large enough to hold bigger items such as eyeglasses but is still small enough to easily store. After trying many other solutions and cloths that claim to completely clean fine jewelry, these people were very impressed with how well the Black Hills Gold Source Model 890 works. They state that it truly does remove dirt and grime from every nook and cranny of your valuable items without causing any damage to the pieces. They especially liked that no chemical solutions were needed that could leave a bad odor behind. The Ivation IVUC965 Digital Ultrasonic Cleaner is incredibly easy to operate. All you need to do is fill the tank with water from your tap in order to get the professional results you have been looking for. It only takes a few minutes to complete the cleaning process, and it works on all of your fine jewelry as well as eyeglasses, watches, lenses, CDs, filters, DVDs, shaver heads, dentures, ornaments, and retainers. Millions of the microscopic bubbles this device creates will clean your valuables better than you can by hand with a brush. Your things will look brand new again without vigorous scrubbing or the use of harsh chemicals. You can adjust the power of the Ivation IVUC965 with three separate energy levels. The lower power level is ideal for delicate items while the high power one will tackle tougher jobs. You can use the digital settings to select which of the five different time cycles you will want to use. These time periods range from a quick 90 seconds all the way up to a full eight minutes. By setting the cycle to the correct time for the amount of dirt and grime you have to remove, you will be saving both your time and electricity. The removable water tank makes this ultrasonic cleaner convenient to use. Rather than lifting up the entire machine to dump out the contents, you only have to take out the tank itself for dumping. It also comes with a detachable cover and carrying handle. The tank is created from stainless steel, and it has ample room for larger pieces such as your CDs and DVDs. The machine has an overall compact size that is easy to store at home or work. It also comes with a fine finish for durability, as well as cleanliness, and a heavy duty, double safety structure. The accessories that come with it include a jewelry basket, instruction manual, CD/DVD stand, and a watch and earring holder. The tank has a capacity of 17 ounces, and it will measure five by six inches. The exterior dimensions are 7.9 by 7.7 by 5.9 inches, and it weighs 2.85 pounds. The Silent Technology used in the development of this ultrasonic jewelry cleaner allows it to operate quietly so that it won’t disturb you. It runs with 35 watts, AC100 to 120 volt, and 60Hz. Those that posted online reviews were very impressed with the value of the Ivation IVUC965 Ultrasonic Jewelry Cleaner. They appreciated how quiet it was when in use, and they were surprised at how well it removed dirt and grime. It cleans especially well in the very hardest to reach crevices on fine jewelry and watches. It will make eyeglasses look like new again, and the tank will easily hold larger items. The basket can be inserted to hold items that could become scratched or damaged on the bottom of the tank during the cleaning process. A big selling point with this device is the removable tank. Any risk of getting water into the actual mechanics of this cleaner is eliminated. The Generic Sonic Wave CD-2800 Ultrasonic Jewelry Cleaner will allow you to successfully restore your fine jewelry to their brand new appearance. This machine can also be used for your precious coins, eyeglasses, and other household items. It only requires tap water to safely clean all of your valuables. You won’t have to worry about the damaging effects of harsh chemicals or waste time scrubbing with a brush by hand. Each piece is left with a sparkling look when finished. All of these items can be cleaned without having to take them apart. This device will remove grime, dirt, lime scale, rust, residue, and fungus from hard to reach areas easily. The illuminating light and transparent cover allow you to watch as each item is gently cleaned with millions of the microscopic bubbles. All that is needed to operate the Generic Sonic Wave CD-2800 is a full tank of tap water. It will give you the professional results you are searching for in just three minutes. It uses 42,000 ultrasonic energy waves each second to create vibrations that will leave jewelry looking new again. It is a durable machine with a 20 ounce stainless steel tank. It comes in a compact size, and it is quiet when running. This particular ultrasonic jewelry cleaner can be used to clean rings, necklaces, earrings, and bracelets as well as eyeglasses, silverware, keys, metal badges, waterproof watches, watch bands, razor blades, shaver heads, combs, dentures, toothbrushes, nozzles, valves, printer heads, and other machine parts. It will measure 5 by 8 by 5 inches, and it weighs 1.7 pounds. It is manufactured by Clear Max in China. Those that posted online reviews remark on how well this ultrasonic jewelry cleaner works for the price they paid. Many people didn’t expect much when they saw the low price point, but they later said that it did indeed clean jewelry and other household items perfectly. Adding a small amount of soap or detergent will help with harder to clean items. You won’t be getting the preset cycles found on the high end ultrasonic cleaners, but this one works nicely on many of the most common household items you will be putting in it. Think about exactly what you will be cleaning in your ultrasonic jewelry cleaner before you make a purchase. If you are only cleaning jewelry, a smaller model will be fine. Larger pieces such as CDs, DVDS, and eyeglasses will require a bigger capacity. Match the measurements of your largest items to be cleaned with the dimensions of the parts basket that comes with the cleaner. Look for parts baskets and trays that are included in the purchase price. These support the items you are cleaning so that they and the interior of the tank are protected from damage. The bottom of an ultrasonic cleaner’s tank vibrates to create the microscopic bubbles needed to remove dirt and grime. Solid objects that rest on the floor of the tank can wear through the metal over time. A basket will keep this from happening. Think about whether or not you will need heat in your ultrasonic jewelry cleaner. This will depend on what you are cleaning. If you want to remove grease, oil, or blood form an item, you will definitely need a model that includes a heater. If you are simply keeping your fine jewelry items looking new, a heater isn’t as important. Most models that do not have a heater will have you fill the tank with hot tap water. Many of the ultrasonic cleaners will use between 35 and 45 kHz. This is well suited to many household cleaning jobs. The lower the frequency is, the louder the noise will be coming from the machine. Higher frequencies make smaller cavitation bubbles that will more effectively cover complex surfaces. A higher frequency is preferred for cleaning delicate jewelry. The watt per gallon of water is an important number. The more solution the ultrasonic jewelry cleaner uses, the more power it will require for cleaning. More power may indicate a quicker, more effective cleaning, but this is not always a good thing. Too much may damage soft metal finishes, electronic parts, and other delicate pieces. Adjustable power levels are best for cleaning sensitive items. If you are looking for a name brand machine that will keep your accessories sparkling, the Magnasonic Professional Ultrasonic Polishing Jewelry Cleaner is what you want. This device allows you to select exactly how long you want to clean each item, and it delivers outstanding results. The basket and watch rack help you safely remove dirt and grime from all your valuables. 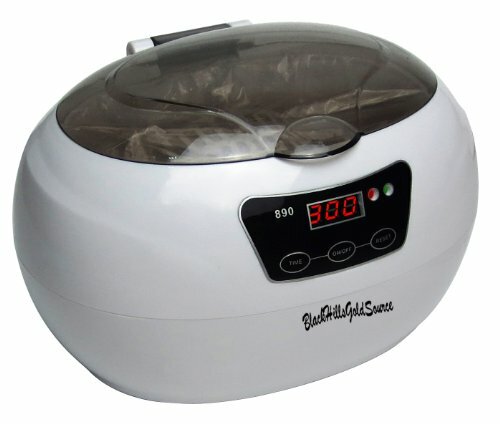 The Black Hills Gold Source Model 890 Professional Ultrasonic Cleaner offers many of these same great features in a digital version with an easy to read display screen. 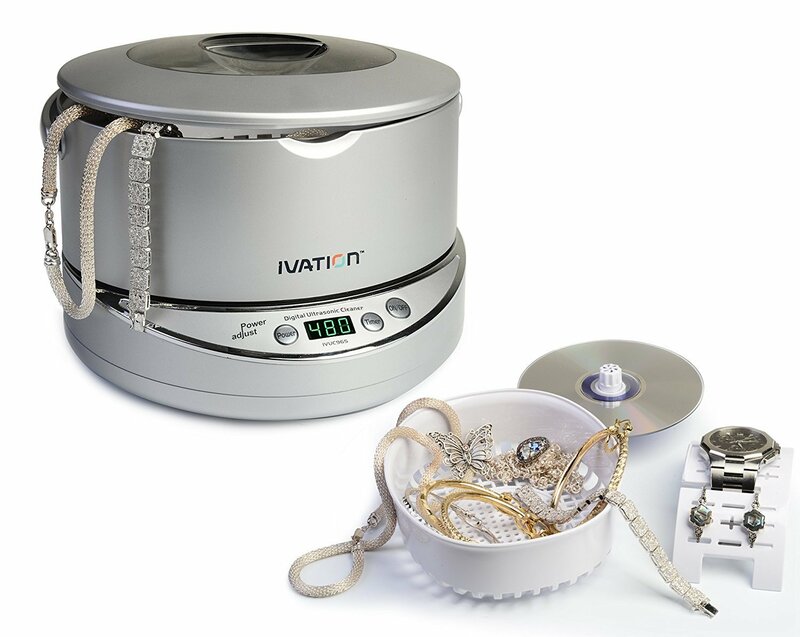 Those searching for an easy to use ultrasonic jewelry cleaner will want to consider the Ivation IVUC965. This machine has a removable tank that makes filling and dumping the water a simple task. There are no worries about getting the mechanics of the device wet when operating it. If all you are really interested in is an easy and affordable way to maintain your favorite pieces of jewelry, the Generic Sonic Wave CD-2800 Ultrasonic Jewelry Cleaner is for you. It is a basic machine with limited options that will keep your valuables looking brand new.